I was just getting ready to plan a little trip out to Junction Cave near Grants with me son when I found that they’ve closed it. These are the lava tubes at El Malpais. They were awesome! You’d go about a quarter mile in, sometimes crawling, through lava rock caves. They say they’ll eventually open it for recreational permits. Sounds like something they wouldn’t be issuing to a 6-year-old kid. Who needs that many types of bait? Author nalterPosted on March 31, 2011 Categories Albuquerque, outdoorsLeave a comment on Who needs that many types of bait? Since we have a 3rd kid on the way, my cousin (jokingly) recommended a bicycle for 5. 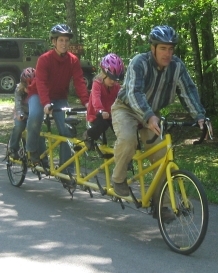 He told me about this family, who used theirs to pedal across the US to Alaska. I don’t think I’d do that with only $300 in my pocket. I think a minivan might be more my style…a $300 minivan. A school in West Virginia is getting rid of swings because they’re too dangerous (lawsuit-wise). I suppose playgrounds have gotten rid of seesaws and merry-go-rounds. (I include links for kids who’ve probably never even seen these…they were awesome!) I guess swings had to be next. I predict that a playground in the year 2050 would consist of a series of 2-foot foam domes…each with liability cameras…and some parent will still sue for emotional damage. Author nalterPosted on September 1, 2010 Categories outdoorsLeave a comment on No swings for you! Vanessa and I went with our friend to the shooting range yesterday. I’d never shot a gun before, aside from a BB gun. I wouldn’t buy a gun, but it was fun to try them out. We fired a .22 rifle, a WW II Mauser rifle, some kinda large .45 pistol, and a 30-06 rifle with scope. The little .22 was like a BB gun. The pistol seemed kinda shaky in the hands to me. I prolly don’t have very steady hands. The rifles had huge bang and kick…a surprise every time. The best part I think was hitting a metal plate 200 yards away through a scope. I was surprised that you can’t tell if you hit anything because of the kick of the gun. Our friend said you don’t have to worry about the kick throwing you off because the bullet’s already left the gun at that point. You usually have to have someone else tell you if you hit the target. We took a walk in the desert to some volcanic rock hills near our house last night around dark. I almost stepped on a small rattlesnake. It slithered away and barely made much noise until it got under a rock and then started rattling. It didn’t strike at me or anything. Later on, another another one immediately started rattling and I walked out of the way pretty quickly. I don’t remember ever seeing a rattler in the wild, but they seem to love warm rocks when the sun’s going down. We also saw the international space station flying by…looked like a slow flying star or something. Vanessa’s brother and family have been visiting and I’ve gotten in some time on LittleBigPlanet with the kids and Supreme Commander 2 with da bruvah-in-law. We figured out how Mia unlocks Vanessa’s cell phone. She opens the slider keyboard and then closes it. Brilliant! I think I got her hooked on cellphones already by putting The Presets – My People on there. She loves to hold the phone and dance to it. We ended up camping at Red Canyon in the Manzano mountains last weekend, since Jemez was closed due to fires. It was a nice time. Walmart tents are made mainly to catch the zipper. I am now an expert at unsticking zippers. Pull the stuck cloth from the zipper as you pull it back and forth. It only took us about 2 hours to set up the tent. Yeah, we’re not handy. Lessons learned: Get your tent on level ground, clear the ground of ALL sharp/pointy sticks, pillows are nice. Mia’s somehow figured out how to unlock Vanessa’s phone…which is quite a feat for a 1-year-old. We’re not sure how she figured it out, but she’s called someone, tried to sign into AIM, and possibly other stuff. Well, we’re off to the Jemez area for some camping this weekend. We’ve actually convinced Vanessa to come along, which is apparently no small feat! I took a little bike ride in the nearby desert with Sean the other evening. He learned that riding is sand is hard/impossible. He fell of his bike and his hand landed on a purple flowery plant with white fuzz all over. The white fuzz turned out to be extremely fine stickers. What a mean plant! Well, it’ll be pretty cool mountain biking out there, assuming we can find some non-sandy trails.